Target publication date mid 2017. There are dozens of diets out there — all different. So how can they all be right? The answer is they all work for someone, but no one diet works for everyone. This is because no two people are exactly alike; multiple genetic variations make each of us unique. We vary in our taste sense, digestive capabilities, food intolerances and allergies, optimum calorie ratios, nutrient needs, and susceptibility to food-borne bacteria. In short, we are as unique diet-wise as our fingerprints. Therefore, we need diets that are individualized to our unique biological needs. Why are we so different? Because we have inherited ancient dietary patterns from our distant ancestors, who ate specific evolutionary diets. Hence our digestion, metabolism, taste buds, enzymes, food tolerances, and food allergies are all slightly different than other peoples. Why is this important? Because the wrong diet leads to serious problems: food allergies, inflammatory diseases and even autoimmune disorders. There are four kinds of food allergies. Immediate allergies are acute and serious, and have reached epidemic proportions in the last three decades. The three kinds of delayed food allergies have also increased, but often go hidden and unrecognized, and are now linked to many chronic symptoms, inflammatory and autoimmune diseases. Even if you are young and have no serious diseases yet — you will someday! You must take care of your body today, so that it will take care of you tomorrow. Biotype Diets™ offers a solution to these problems. It is the first comprehensive scientifically validated diet-typing system. It employs clear and specific genetic markers that identify our biological types — the five key blood types: A1, A2, B, O, AB, plus the Rh-negative subtype. It also employs the most accurate and precise methods to determine safe verses harmful foods — testing for all four kinds of food allergies. 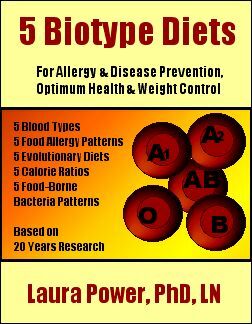 Based on these, it provides 5 unique Biotype Diets, which will provide you with the diet that is right for your biological type and subtypes (gender and age). Each diet chapter explains in detail which foods are safe, allergic, and borderline. There are case histories, menus, tables and graphs – all clearly and simply presented. Biotype Diets is based on 20 years of original scientific research, and supported by a pending patent, trademarks, publications, and scientific endorsements. Other unique highlights include: the Food Allergy Pyramid™, the Food Allergy Index™, and the Diet Compass™ (a geographical pattern of evolutionary diets). Biotype Diets benefits all ages and types by preventing food allergies, inflammatory diseases and autoimmune disorders, and by promoting optimal health, well-being, longevity, and weight control. Copyright Laura Power, January 1998, January 2006. All written material, data, graphs and graphics on this site are the exclusive properly of Laura Power. It is unlawful to use this information without express written permission.